College students tend to rely on a lot of tech for school, and for them, the hot new trend is the smart dorm. It’s like a smart home away from home. Back to School savings at Best Buy include up to $150 off select computers, plus students can save an extra $100. Visit the Best Buy Student Deals page for more information. Has your Internet been slow? When troubleshooting, it’s important to remember that for many devices you’ll need to check two different connections: your wireless network and your broadband access. For this week’s #TechTuesday segment, I discuss how to check your Internet speed with Bill Wills of WTAM 1100 Newsradio. While the smartphone news has recently been dominated by iPhone and Android, the recently announced BlackBerry Passport may interest some with it’s promise of being an “office on the go” device. Physical Keyboard – The Passport combines a physical keyboard and a line of changing screen-based keys above that will make heavy email and messaging users happy. Battery Life – BlackBerry is claiming 30 hours during normal use with its 3460mAh battery, providing cordless productivity while away home or the office. Large Screen – A unique 4.5 inch square screen provides a large viewing and touch area for emails, work documents and websites. 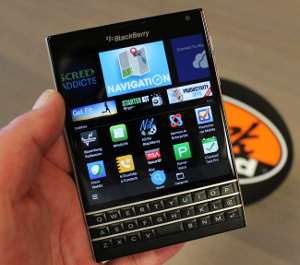 BlackBerry Hub – An app that keeps your conversations in one place, including BBM, email, phone and social media. Android Apps – The phone not only runs BlackBerry World apps, but Android apps from the pre-installed Amazon Appstore.